It’s time for the monthly sales and marketing meeting…you know the one…all attendees give an update of some kind on their assigned KPIs. As the marketing person, you’re responsible for reporting on website traffic. The higher the number of visits, the happier the powers that be are. After all, increasing traffic means increasing sales, right? In many small to mid-market B2B organizations, the number of visits over a defined period of time is considered a KPI and is discussed on a regular basis. What sometimes gets lost in that discussion is the number of conversions those visits actually lead to. Let’s say at the end of 2014 your website was averaging 5,000 visits per month. One of your goals for 2015 is to increase the number of visits to 10,000 per month by the end of the year and so far, every month the number has ticked up. That’s a positive, right? On the surface, it is. But further investigation into the numbers reveals that sales have actually gone down every month so far this year. Qualified inbound leads generated so far have also gone down. What could be the problem? The problem may be that the RIGHT type of traffic isn’t visiting your site. Site visits mean nothing if they do not result in conversions and sales. A site that receives 5,000 visits per month and converts 250 of them to leads is far better than a site that receives 10,000 visits but only converts 150 to leads. So how do you get the RIGHT traffic to visit your site? Here are four steps to help you get your conversion numbers moving in the right direction. In smaller organizations, it is easy for a website to become a static object instead of one that is always evolving. Make sure your website is really ready for visitors. Evaluate how fast it loads. Is it optimized for mobile use? Is it clear to visitors what services or products your company provides? Does it guide visitors to the pages they should visit? What about calls to action? A clean, well-organized site that provides information in a straight-forward way will lead to more conversions. If you’re already an inbound marketer, then you have probably created your buyer personas. If you haven’t gotten them done for whatever reason, now is the time to do it. Eric Entrepreneur – Eric is the owner of his business and is a big picture thinker. He has always been part of the sales effort but would like to get out of the sales role. Victor VP Sales – Victor was hired by Eric and has been charged with sales growth. He has more of a focus on the day-to-day. Morgan Marketing – Morgan leads the marketing efforts for his/her company. He/she typically has a traditional approach but is becoming more interested in the inbound methodology. This is just a snapshot of our personas. We have gathered additional information about each one including their pain points, their goals, the objections they may have to our services, where they go to gather information and even their age range. Knowing all of this allows us to select long-tail keywords that they may use when searching for our services. For those who are not familiar with long-tail keywords, here’s HubSpot’s less-than-100-word definition. The chart below (also from HubSpot) graphically explains the concept and demonstrates why long-tail keywords help drive the right traffic to a website. At Imagine, keywords we might consider include sales or sales growth. As the chart shows, these types of general words and phrases will not yield great results for us. If we write all of our content using keywords like those, we probably won’t get very far. But if we take a long-tail approach and target this phrase, “sales growth for small B2B businesses,” we will have a greater probability of ranking higher on that search and it is something one of our personas (Eric or Victor) may actually type when searching for ways to grow sales. 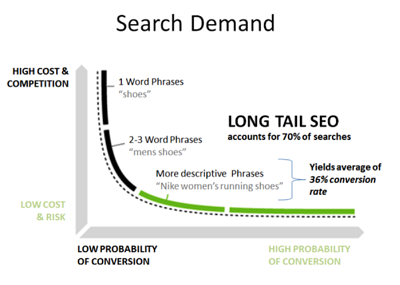 For more on long-tail keywords and keywords in general, read this post from HubSpot. Now that you’ve figured out the keywords to write for…you need to start writing and creating content for your audience. The content needs to exist before anyone can find it. There are lot of different types of content including videos, blog posts, white papers, ebooks, case studies, infographics and webinars. The key to creating content that drives the right traffic to your site is understanding your buyer personas and their buyer’s journey. The content you create needs to be relevant, educational and useful to your personas. If you understand what keeps them up at night, their pain points and how they gather information on a problem, you will be able to create content that will draw them in. Your content should not be an advertisement for your products or services. It should be something that is helpful to your target audience. It is also important to be consistent with new content. The search engines are always looking for new content. The more often you post, the higher your search rankings. Promote your premium content using social media. In your posts, make it easy for your audience to share what you’ve posted and find your website. There are many social media platforms available to you. LinkedIn and Twitter are two that many B2B organizations find valuable. Select the platforms that work for your business…the platforms your audience is using. Another way to promote your content is through email. Let your contacts know when a new piece of content is available. Segment your lists carefully and only send relevant content to them. Include calls to action in your messages and make it easy for them to get to your website from the email message. 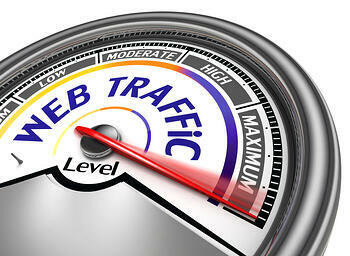 Driving the right traffic to your website is an important part of your marketing and lead generation strategy. Take the steps to make sure you’re website is attracting the visitors you’re really looking for.